When going out for those long winter rides, gels and energy bars are not always that appealing. 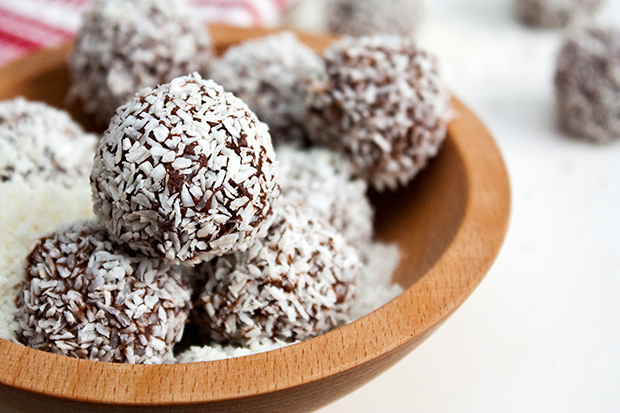 Instead, why not try making your own energy balls that can be specific to you? Making these are cheap, quick and easy. These are my go-to for those long 4hour rides. I even add in protein recovery powder just to start that recovery more quickly.For a great Christmassy/wintery look, try rolling the balls in desiccated coconut! This batch makes 12 balls and each serving is 3 balls. Soak the date in 1 cup of boiling water for 15 min (or longer) and then drain. Blend all the ingredients to form a paste and roll into balls. If the mixture is too dry, add a splash of water. Leave plain or try coating in desiccated coconut for a more festive look! These energy bars are so delicious and packed with plenty of goodness. They're perfect for having on the go, before or after your ride or during a competitionto keep your carbohydrate stores topped up. Place the dates into 200ml boiling water and set aside for 5 minutes (remember; do not throw the water away afterwards). Into a food processor, add the hazelnuts, almonds, oats, mixed seeds and dried cranberries, and blitz until a rough consistency is formed (you still want to be able to see roughly chopped chunks of nuts). Transfer the dates from the boiling water to the food processor, and add the coconut oil and the desiccated coconut. Blitz again until a consistent mixture has formed .On a hob, gently heat the remaining water from the dates with 1 banana until a date and banana puree has formed. Add the date and banana puree into the food processor. Line a baking dish with grease proof paper before transferring the content of the food processor. Let cool before transferring to the fridge. 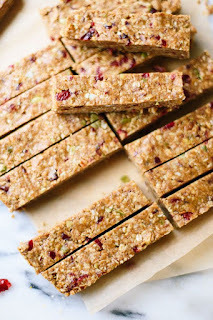 Once cool, cut into 16 energy bars. 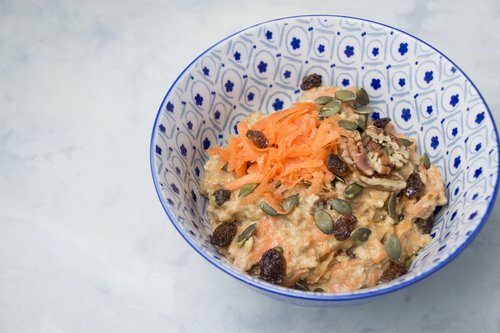 This carrot cake porridge is great for topping up the tank before a morning ride or perfect for helping replenish carbohydrate stores post-ride. In a saucepan, add your oats, milk, water, salt, grated carrot, sultanas, cinnamon, ginger and nutmeg and maple syrup. Heat gently, stirring continuously. Once warm, serve and top with crushed pecan nuts and pumpkin seeds. I would like to say a big thanks to Sean Buxton who introduced me to these recipes. Hope you enjoy them and let us know how you get on! !